Many warm thanks to Livia for having me here. Hello! My name is V.L. Locey, and I`m a writer of romantic comedies for all, which means that I write both M/F and M/M tales filled with laughter and love. Ever since I was a young girl I was fascinated with mythology. There was something magical and special about the legends of Heracles, Achilles, Perseus, and Odysseus. I would spend hours reading books about the Greek pantheon. I cannot recall how many times I watched the first Clash of the Titans movie. More times than a grown woman should, that`s for sure. I am a huge fan of Edith Hamilton, and use her novels as some writers use a dictionary or a thesaurus. It always struck me as sad that some people couldn`t enjoy mythology as I did, but given how it`s presented in classrooms from elementary school through college, it`s no wonder so many hate Greek mythology. I`ve tried, through my writing, to bring the gods to life. I`ve gone in and blown the dust bunnies off Zeus` marble nose and ran my Swiffer over Hera`s peacock feather fan. With my self-published books I`ve taken the gods and goddess and dropped them into our world, with some hilarious and romantic results. 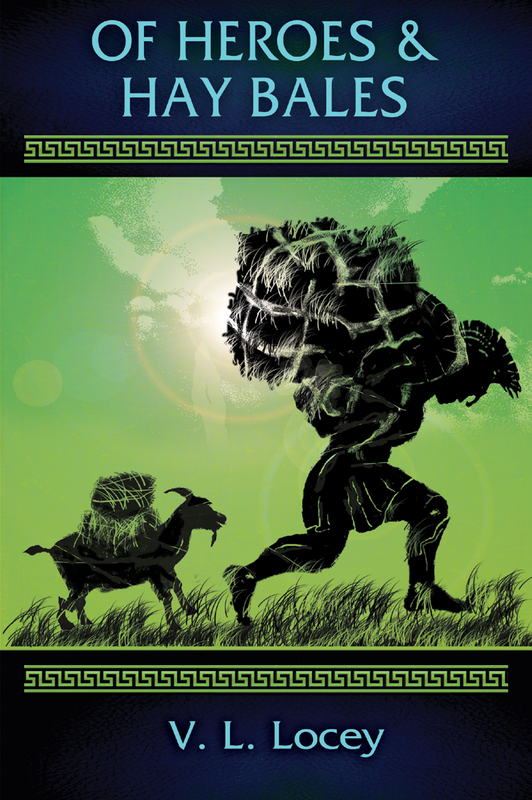 In Of Gods & Goats, which was released last year, and my newest tale Of Heroes & Hay Bales, my readers have gotten to know Libby Simons, a widowed goatherder living in the mountains of Pennsylvania. They`ve also been fortunate to meet and swoon over Ares, the Greek god of war, who takes a tumble from Olympus and ends up dazed – and quite naked – in Libby`s goat barn. Their love and adventures have grown as the story of their battle against Hades unfolds. There are tons of action scenes, some hot hay mow and fireside scenes, and lots and lots of love and laughter. And that`s how Greek mythology should be presented, don`t you think? To celebrate my coming to visit here today I`ll be giving away a copy of each of the books in my Gods & Goats series to one lucky commenter! Thanks again to Livia for having me here, and may the gods smile upon you. I came across a small fence, perhaps four feet high, constructed of flat rocks. The moon was brilliant and I could see the goats meandering around inside their pasture. Sheep also were in the flock, their white coats making them look like low hanging clouds. I climbed over the rock wall and moved among the goats. They were a mixed bag of breeds, but well-tended to say the least. A sheep raised its head from a make-shift manger of split logs, said hello then returned to its meal of dry grass. The heap of hay smelled wonderful. It was freshly cut and dried. I heard Ares slinging his big old self over the wall. His armor clattered as he moved. The flock disliked his noise, and perhaps his aura of violence, for they began to skitter away from me. Ares hissed my name. I ignored him and took another few steps, my soggy sneakers squishing with every footfall. Ares called to me once more. I stopped and frowned as the herd streaked off, screaming like a wolf had slithered into their midst. I looked up the side of the rock embankment, the same I saw from the sea as we approached, and noted a large round opening at the base of the natural pinnacle. Yellow light, like that a fire would cause, shone down on the well-worn path lined with torches leading to the cave. I decided to head up to the cave and perhaps speak with the shepherd of this fine flock but Ares` hand slapping down on my shoulder so soundly that I almost buckled put the brakes to that idea. I spun around to give him a firm scolding then froze before the tongue lashing could begin. A call came from within the cave. A voice so deep and so robust it made small pebbles break free from the jutting mountain and roll down over the glowing doorway. The goats and sheep ran towards the odd, baritone summons. I stepped backwards into Ares. The ribbons attached to his lance blew over my forearm. “Gesundheit,” I squeaked. The huge man who tended this flock then reached out with his left hand and tugged a torch from the rocky ground. My mouth fell open when I saw his bald head, ragged ears, scarred face and one eye. Let me reiterate that just in case your mind is as stunned as mine was. One. Eye. Smack dab in the middle of his forehead. My eyes were so wide they were drying out from the sea breeze. My first instinct was to turn and run. I actually tried but Ares wrapped his arm around my waist and jerked me to his chest. “Well, sure his eyesight is poor; he only has one damned eye!” I cringed as the ground vibrated under our feet. http://thoughtsfromayodelinggoatherder.blogspot.com/ link to my blog.